We’re two-thirds of the way through the home and away season and as we start the run home to the finals, all nine teams are still a chance to get there. It will be hard for the teams outside the five, but not impossible. Round 12 was played on a fine weekend. It was cold but conditions were good for footy. It was a round where all four home teams won; and the results of the games could have major implications on how the final ladder takes shape. When the UTS Bats ran onto Trumper Park for their game against the East Coast Eagles, the Bats were down for the count. Seven straight losses saw them on the bottom of the ladder, while the Eagles had hit some good form in recent weeks to move into the top five. A win for the fifth-placed Eagles would have made it difficult for the teams below them. It wasn’t to be however, as the Bats rebounded off the canvas to return to the winner’s list in a thriller. The Bats went into the game knowing it was now or never and the first quarter reflected the desperation and intense effort that they knew they would have to put in. It wasn’t always pretty to watch, but it was effective, as the Bats threw their bodies into every contest and refused to allow the Eagles any easy possessions. Numerous packs developed around the ball with UTS players at the bottom of every one, determined not to give the ball away. Only four goals were scored in the quarter, and with the Bats scoring three of them, they led by 13 points at quarter time. The Eagles had been under physical pressure in the first term, but made some efforts towards breaking the shackles in the second quarter. It wasn’t easy for the Eagles however, against a very determined UTS side. During the second term there were occasions when the Eagles were able to turn on some of their best footy, but this game was going to be a hard grind. The Eagles won the quarter after kicking four goals to three, but the Bats still had the overall advantage as they returned to the rooms at half time with a nine point lead. It had been a good first half for the Bats, but there was more to be done in the premiership quarter if they were to snap the losing streak. In the third quarter, they got it done. It was a more open quarter of footy than what had been displayed in the first-half. The Bats rose to the occasion and came up with the answers to the challenges the Eagles threw their way. The scoreboard reflected their efforts, as the Bats scored four goals to two for the quarter, building up to a 20-point lead at the last change. Hopes were rising in the UTS camp, but the Eagles weren’t done yet. A run of goals in the last quarter for the Eagles meant there was again little separating the two sides. Twice the Bats managed to find the big sticks, giving them a much-needed buffer. The Eagles kept coming, and their fifth goal for the quarter saw the margin back to within a kick, but the Bats hung on for dear life until the final siren sounded. Just three points was the margin, but that was enough. The Bats were back on the winning list. Louis O’Keefe kicked four goals in a best-on-ground performance, while Sam Netherole and William Thompson also featured prominently for the Bats. The Bats are still two games plus percentage behind the Eagles, and it will take something special for them to make the finals from here, but it is not impossible. Aaron Drinkwater, Stuart Turner and Derrick Visser were best for the Eagles. This was one that got away for the Eagles, and not even their last quarter heroics were enough to salvage it. A win would have opened up a big gap between fifth and sixth, and virtually sealed the top five. But it wasn’t to be and the Eagles still have some work to do to ensure their place in this year’s finals. Meanwhile at Blacktown No. 2, the North Shore Bombers took on the Manly Warringah Wolves. The Bombers went into the game placed much higher on the ladder, but the Wolves have been something of a bogey side for North Shore. Manly went into the game having only dropped their colours once to the Bombers since their promotion to Premier Division, including an easy win when the two sides played at Weldon Oval a few weeks ago. In the early exchanges, the Wolves gave every indication that they were a real chance to keep their winning run against their local rivals intact. Hitting the ground running, moving the ball quickly out of the centre, the Wolves were getting plenty of the ball around the ground and putting pressure on the Bombers. North Shore were hanging on and fighting back with some blows of their own; but the Wolves looked in control and could have achieved more than their nine point lead at quarter time. 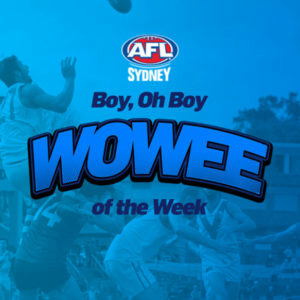 The Wolves had the lead going into the second quarter, but every time they threatened to run away the Bombers would peg them back. Manly’s momentum had been stopped, but North Shore’s run hadn’t yet been implemented in a quarter that saw little separate the two teams around the ground. On the scoreboard the Bombers took the edge late and with four goals to three in favour of North Shore for the quarter, scores were level at the long break. The third quarter was an arm wrestle, the stakes were high and neither side was backing down. Manly lift when they take on their local rivals, but the Bombers were not making it easy for them. Both sides faced up to the challenge, denying easy touches, making sure every possession was hard-earned and this meant there was reward for intense effort. The game was still in the balance at three quarter time, although a quarter of three goals to two had given the Bombers a lead of nine points at the final break. It had been an intense three quarters, but finally in the last quarter something had to give and it was the Bombers who capitalised. The Wolves had worked hard against one of the competition heavyweights for three quarters, but had nothing more to give. Finally North Shore players who had struggled to shake off the close attention of their Manly counterparts began to wield some influence and get on top. The quarter would yield five goals to two in favour of the Bombers, extending the final winning margin to 29 points. With the win, the Bombers stay third on the ladder, half a game clear of St George. Josh David-Wright stood tall on the forward line to contribute four goals. Shaun Crane did plenty of work to lift the Bombers and construct the win with a best-on-ground performance, while Andrew McConnell and Kirk Lower also featured prominently. Dean Meadows, Anthony Robertson and Ryan Wearne were best for Manly. The Wolves put up a gallant fight, but were unable to take the points. With their poor percentage and UTS winning their game, Manly find themselves at the bottom of the ladder. They can still make the finals, they’re only two games out of the five; but they’ll need some big wins back to back to get there. One of the old footy sayings is that bad kicking is bad football, and the wayward finishing of the Pennant Hills Demons would cost them dearly at Olds Park on Sunday afternoon. Despite having ten more scoring shots than the St George Dragons, the Demons would go down to the Dragons by 15 points. The Demons went into the match knowing that after East Coast’s loss, a win would put them only half a game outside the top five with a game in hand. They went in hard during the first quarter, winning plenty of the ball but frustrating themselves when they got it inside 50. Shot after shot that should have been kicked sailed wide of the big sticks and the Demons would only manage one goal for the quarter. At the other end, the Dragons showed them what they should have done, as they efficiently kicked five goals from fewer inside 50s; and the Dragons led by 17 points at the first change. There was a bit of a flukey wind, but it wasn’t that bad with St George showing that kicking straight could be done. But once the inaccuracy rot had set in, so did the pressure and the uncertain mindset was clear for all to see. The missed shots continued and at times the Demons would play on rather than risk the ignominy of another set shot sailing wide. The Dragons would kick the only goal in the second term to lead by 19 points at half time. At one stage in the third quarter, the Demons were 2.18. In their quest to get what would have been an important away win, the Demons had been their own worst enemy and with each missed shot the frustration grew deeper. The Demons had won every stat except the one that matters. They did so much right around the ground against one of the league’s power teams, but did not get the reward to show for it. The Demons would finally score a few goals late in the third term; but the quarter had yielded four goals to three in favour of St George and the Dragons had extended their lead to 22 points at three quarter time. St George hadn’t had one of their better games, but were far more efficient with the opportunities they had which was enough to get the job done. For the Demons, it was just one of those days when they had played some good footy only to let themselves down with their finishing touches. 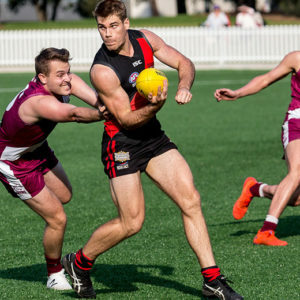 The Demons would win the final quarter by four goals to three, cutting the final margin to 15 points, but St George’s better use of the opportunities they had was enough to get them over the line. Michael Webb, Justin Maldigri and Dom Michalak were pivotal for the Dragons, ensuring the club did enough to take their opportunities and get the game won when it needed to be. The Dragons are in fourth spot, half a game behind North Shore but with a game in hand and the battle for the double-chance in the finals is set to be close. The Demons were well served by the efforts of Aaron Crisfield, Tom Angel and Jesse Hare, but it had been a frustrating day. The loss means they’re still six points behind East Coast and although they have a game in hand, it has been many weeks since they’ve had a win. The Demons will no doubt be doing some work on getting reward for effort through goal kicking during training this week. 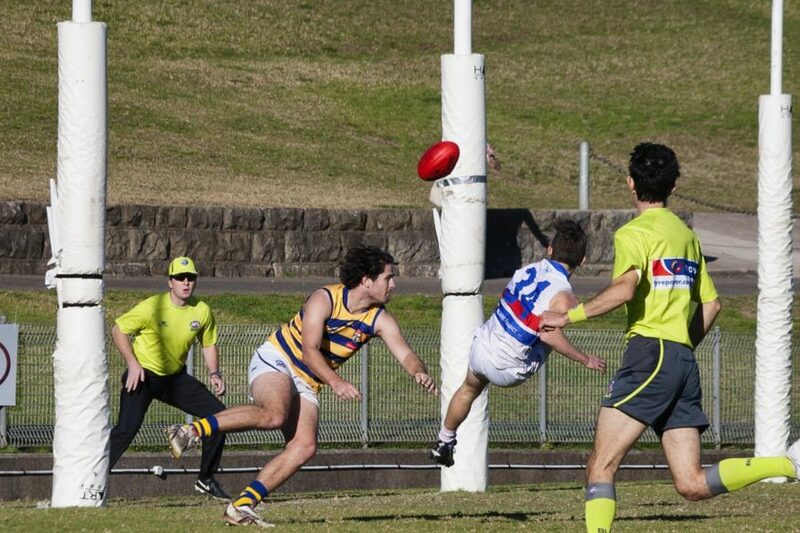 The top two teams were in action at Henson Park on Sunday as UNSW-ES Bulldogs took on Sydney University. The Students, with several NEAFL-listed players, went into the game on top. 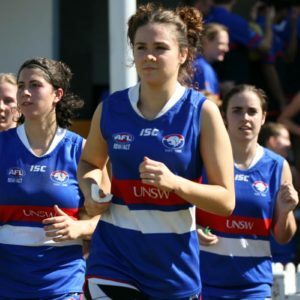 But if anyone had any doubt about the finals credentials of UNSW-ES, they were blown away as the Bulldogs took control from the start with a display of power that took them to a remarkable win. UNSW-ES took to the field determined to make a statement and once the game got under way they wasted no time in making an impact on the scoreboard. The Students have carried all before them for most of the season, but they were not in the contest in the opening quarter as the Bulldogs got off to a flyer. Time and again the Bulldogs were clearing the ball out of the centre and pumping it into their forward 50 and the scoreboard reflected what was happening on the field. Eight goals to one in the first quarter saw the Bulldogs leading by 45 points at quarter time. The Students had been shell-shocked in the first quarter, and it would be a long way back from there. They managed to stop the Bulldogs getting any further ahead during the second term, making some ground in stopping the momentum. It would be a long way to get back into this game, and the Bulldogs would be hard to stop with their confidence flying so high. 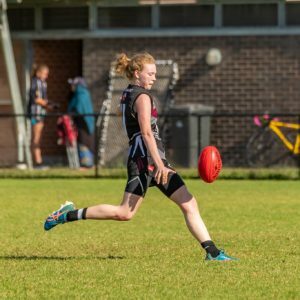 The Students would win the second quarter, by three goals to two, although the margin was still 41 points in favour of the Bulldogs at the long break. The Students managed to recover some ground during the third quarter, although the Bulldogs’ overall lead never looked threatened. After such a dominant first term, the Bulldogs were still comfortably ahead. The Students lifted around the ground, finding some more run and hitting their targets. Five goals would run the Students’ way during the third term, but the Bulldogs would manage two major scores against the run of play; vital breathing space. Although the Students had comfortably won the quarter, the Bulldogs were 24 points to the good at the last change. Thanks to their first quarter, the Bulldogs had enough of a buffer to hold the Students out and the result of the game was never in doubt. The Students never gave up and kept their efforts going in the last quarter, another quarter that the Students would win by three goals to two. Despite the Students winning three quarters, the blistering first term by the Bulldogs gave them enough of a lead that the Students could never seriously threaten them. In the end, the Bulldogs won the game by 17 points. Steven Pollock spearheaded the charge with four goals, while around the ground the efforts of Jake Bartholomaeus, James Bell and Tom Heath were instrumental in their success. The win sees the Bulldogs draw level on games with the Students on the ladder, with only percentage keeping the Bulldogs second. To keep up with the star-studded Sydney Uni side is a sign of the tremendous improvement the Bulldogs have shown this season. Mitch Mahady, Monty Krochmal and David Johnson were best for the Students. They had shown something from the game by their fightback in the last three quarters after such a poor opening term and thanks to their impressive percentage they are still top. Although top, the Students are far from invincible. There is good news for both of the top two teams at the end of the round. After UNSW-ES’s joined the Students at the top and sixth-placed Pennant Hills’ fell to the Dragons, the mathematics are now clear. Sydney Uni and UNSW-ES are confirmed as finalists for 2017 and their places in the top five are mathematically secure.